I love December for a lot of reasons. Christmas and a LOOONNNG University Holiday rolled into one month is ultimately my favourite thing about this month. So, here’s a recap of some of my favourite things I have loved about December! If you want to have a look at the things I’m planning on doing / have already done in December read THIS! In Australia, Uni/School usually shuts early/end of November/December. For us Uni students, we get three months of holidays. For this reason, as soon as I’m on holidays, I’m always super thrilled and excited because I have all the time in the world to shop for Christmas lights and other decor! This also means Christmas Parties and BUYING NEW OUTFITS for that! I actually really love Christmas lights and it’s one of my favourite things about December. I love driving past and seeing houses all dolled up in pretty lights and seeing what other decorations my neighbours have put up. I also love seeing CHRISTMAS DECOR people have put up inside and getting inspired by them! Mmmm, I love Christmas pudding. I’m actually craving Christmas pudding just by writing this haha! I’m not a big fan of sultanas and dried fruits/nuts in cakes but for December and when Christmas puddings come out, I can make an exception. I just love how it somehow tastes ‘Christmassy?’. Holiday movies rolling out is probably not a good thing because I’ve actually been recording EVERY Holiday / Christmas movie that have come on TV and I’ve been watching them all non stop which means I’ve been sitting down all day. But even so, I love Christmas movies. HERE are a few of my favourites! December definitely has a smell. Like spice, sugar cookies and pine trees all rolled into one… Right?! All of which are super festive and deeelicious! 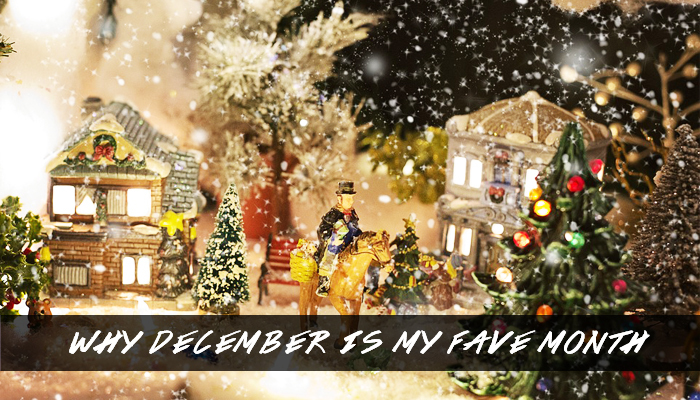 What is your favourite thing about December?